TODA Racing lightweight flywheels increase throttle response and aide in overall vehicle performance. TODA flywheels are produced from 100% chrome-moly steel, not aluminum. With careful attention paid to proper weight distribution, TODA flywheels improve performance without negatively affecting driveability. Chromium Molybdenum (Chrome molly) for technically advanced flywheels. Chrome molly has many useful properties over standard steel, the ones that are most useful to us have to do with the molecular distribution. The molecular make up found in chrome molly gives it less internal stress and a better distribution of mass. This enables TODA Racing to design a flywheel where they can exploit the stress free and balanced nature of chrome molly. i.e. 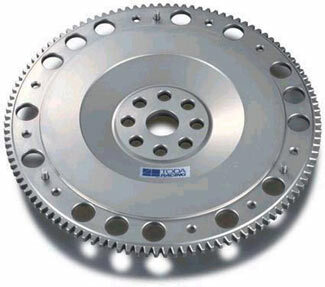 TODA can place the chrome molly were it is needed, such as the clutch face area and remove it from area were it is not required such as the outer edge and ring gear area. Also when TODA Racing heat treat chrome molly they not only keep the flexibility (less stress) but also have improved wear properties,in the areas such as the teeth of the ring gear and the clutch face.